It seems like people either love this movie, or hate this movie. I’d put myself in a new camp. I liked it. It was enjoyable. It was a lot of fun. But I didn’t love it. The action scenes are really intense and pretty great. The origin story is unique enough, although I’m not quite sure why/how he’s so good at fighting/parkour/whatever he’s doing. The humor is where this one is kinda hit or miss to me. Overall the one liners in this seem like they were written for 14 year olds. It’s just very juvenile/crass humor. Don’t get me wrong, there were a few times I laughed-out-loud, but overall the jokes fell flat to me. I also think the 4th wall/self-awareness of the whole thing was kind of hit and miss, too. There were parts where it worked, there were parts where it didn’t. I think if I were to have to choose, I’d have rather it been more typical, especially if we’re supposed to believe it’s in the same universe as the X-Men, etc. Overall, though, it was definitely a fun movie experience. Will I ever see it again, probably not. Would I hate to see it again, nope. This is a funny little rom-com, in the best sense of that category. 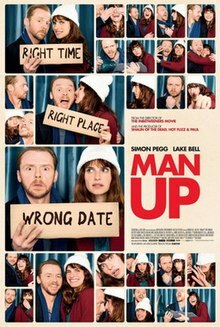 I (usually) like anything Simon Pegg is involved with, and I really like Lake Bell, so this had a leg up off the bat. It’s funny, it’s sweet, it’s quirky, it’s different. It’s good. It’s on Netflix, so just watch and judge for yourself, dangit.